Our Zinc Ointment provides effective sun-protection without allergy, even for those who react badly to all commercial sunscreens, as it does not contain preservatives or chemical sunscreen agents. Our Hypoallergenic Sunscreen contains mineral Zinc Oxide as the sunscreen agent in a natural, water-resistant ointment base, and it is totally non-toxic. 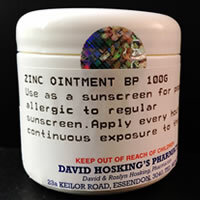 Apply Zinc Ointment every hour for maximum protection in the sun. Although the sun protection and water resistance is good, the product is hand-made so we cannot give precise SPF and water resistance ratings.